The department of Information Systems and Analytics along with the Center for Analytics and Data Science has been fortunate to have a generous donor, Mark Johnson, establish the Mark Johnson Analytics Scholarship Fund to support study abroad opportunities. Scholarship award amounts vary, and may reach up to $5000. Be studying on a Miami University approved study abroad or study away program that is eligible for scholarships. Find out more about eligible programs here. Students will be notified of the scholarship decision within 3 weeks of the application deadline. Scholarship money will be transferred to the student's Bursar Account 10 days prior to the beginning of the study abroad term. 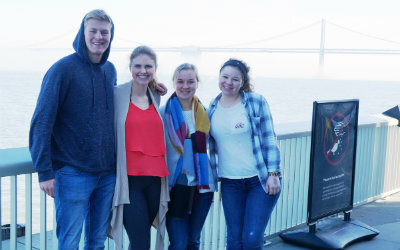 Lena Rutherford, a Johnson Scholarship recipient who studied in San Francisco said when asked about her experience, "I rediscovered a part of me that I had forgotten. I feel like I have a much clearer idea of who I am and how I can contribute to the world".